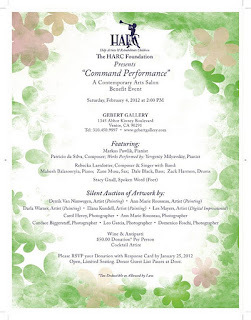 LOS ANGELES (December 26, 2011) – An impressive roster of International and American Performing Artists and Creative Artists will be presented by The HARC Foundation in a special “Command Performance” Contemporary Arts Salon Benefit Event on Saturday, February 4, 2012 at 2:00 PM at Gebert Gallery located at 1345 Abbot Kinney Boulevard (just west of California Avenue), Venice, CA 90291. Valet Parking or free parking as available in rear lots between Abbot Kinney Boulevard and Electric Avenue. The Event will include a Concert, Silent Auction of Artwork and Wine & Antipasti Reception. Cocktail attire is requested. The Concert performances feature International Artists Markus Pawlik, Pianist; Patricio da Silva, Composer & Pianist with Yevgeniy Milyavskiy, Pianist; Rebecka Larsdotter, Composer & Singer with Band: Mahesh Balasooryia, Piano: Zane Musa, Sax: Dale Black; Bass; Zack Harmon, Drums; and American Artist, Stacy Gnall, Spoken Word (Poet). CD recordings of featured performers will be available for purchase. Rousseau, Artist (Painting); Darla Warner, Artist (Painting); Elana Kundell, Artist (Painting); Les Mayers, Artist (Digital Impressionist); Carol Henry, Photographer; Ann Marie Rousseau, Photographer; Candace Biggerstaff, Photographer; Leo Garcia, Photographer; and Domenico Foschi, Photographer. 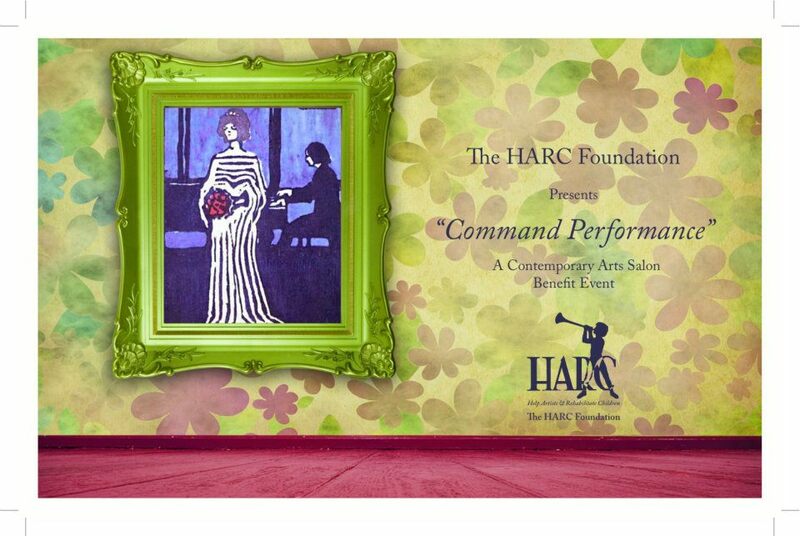 presented by The HARC Foundation (Help Artists & Rehabilitate Children) to benefit The HARC Awards and The HARC Creative Arts Therapy (CAT) Awards. The HARC Foundation is a non-profit 501(c)(3) organization dedicated to preserving and promoting the value of creative arts and creative artists in America as well as rehabilitating abused and neglected children through the creative arts. 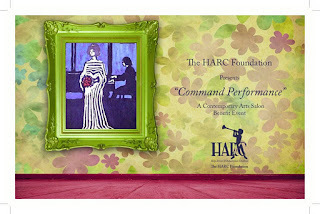 Tickets are $50 donation per person, tax deductible as allowed by law, and can be purchased by credit card on HARC’s Donations Page http://www.harcfoundation.org/donations.html by clicking on Event Tickets Buy Now or by calling HARC at 310.823.2310 for reservations and sending a check to The HARC Foundation at P.O. Box 11596, Marina del Rey, CA 90295. Due to limited open seating, Invitation RSVPs, reservations and ticket pre-payments are requested by January 25, 2012. Donor list passes will be held at the door. purpose to discover, support, promote and present emerging creative artists from all art disciplines and to use the creative arts as a therapeutic science in the rehabilitation of abused and neglected children. Its core mission is to help qualified emerging Creative Artists by identifying their needs and providing solutions through Foundation programs that will benefit their livelihood and encourage achievement of their artistic potential. HARC is publicly supported, funded by individual and corporate donations and grants. 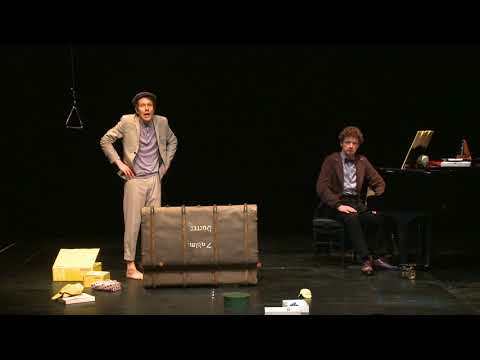 It holds annual national Creative Arts competitions, with winners selected from the five main arts disciplines: Fine Arts, Visual Arts, Music, Dance and Literature. Cash awards, publicity and presentation opportunities are granted for each division as possible. In addition, HARC grants Creative Arts Therapy cash awards to qualified creative artists who wish to become licensed Music Therapists, Clinical Art Therapists, Dance Therapists, Drama Therapists or Writing Therapists and commit to working with abused and neglected children. Abbot Kinney Boulevard, Venice, CA 90291; Steinway & Sons, Steinway Piano Gallery, 314 N.
Robertson Blvd., West Hollywood, CA 90048; Printing Palace, Inc., 2300 Lincoln Boulevard, Santa Monica, CA 90405; Harold Davidson & Associates, Inc., Investment Counselors, 1900 Avenue of the Stars, Suite #2400, Los Angeles, CA 90067; and, several other individual and corporate sponsors. 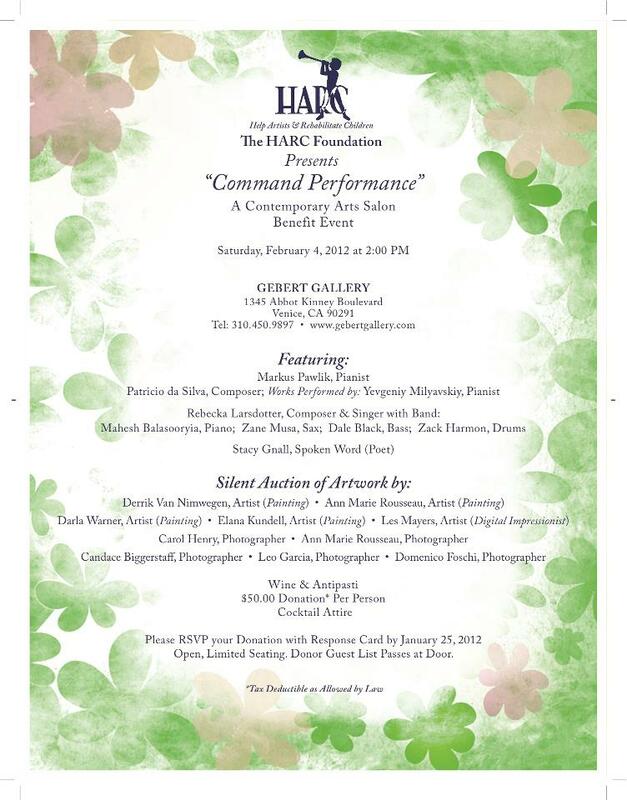 For further information about The HARC Foundation or to obtain additional ticket information, please call 310.823.2310 or see http://www.harcfoundation.org.